"Day-by-day"? Check. Painfully detailed reports on run-of-the-mill drills since the beat guys can't watch real practice? Check. Todd Van Emst pictures of the Chiznick talking to the team after practice? So, so check. Auburn football is back, folks. After spending some five hours in/on airports and airplanes yesterday, and another four making the drive back to the rez from Albuquerque, I crashed and burned before the reports from Auburn’s p.m. practice started trickling out. Saw WR DeAngelo Benton with a wrap on his right hand/wrist after practice. … and immediately felt that tiny part of my soul that enjoys freaking out about these sorts of things freak out a little bit, even though most of me understands perfectly well that this is nothing, and I smiled like it was Christmas morning itself. If we’re worrying ourselves into a lather over nonexistent injuries … if we’re reading entirely too much into harmless, half-thought-out quotes from Auburn’s players and coaches … if the poor desperate beat writers are reporting on the length of Lee Ziemba’s practice t-shirt … and the calendar says it’s not March or April? Then it’s fall camp, and football is right around the corner. — Probably the most revealing bit of information we got from Day 1 came from Craig Stevens, who let drop which linebacker was practicing where and maybe even an early depth chart–one with Eltoro Freeman backing up Craig Stevens on the weakside, and Jonathan Evans backing up Daren Bates on the strongside. I’d take that with a giant grain of salt, but if it’s at all accurate, it should illustrate how serious the coaches are about the Bates-at-linebacker experiment. Stevens’ report that only Harris Gaston and Jake Holland are working behind Josh Bynes at MLB also illustrates how important it is to keep Bynes healthy this year; I have all the faith in the world in Holland’s potential and there’s nothing that says the light can’t come on in a hurry for Gaston–who had a bit of a disappointing freshman season but was also taking a quantum leap forward in competition after playing private-school ball in high school, not to mention dealing with a nagging injury or two–but we’re still talking about two players with zero meaningful snaps at the collegiate level between them. Two last things about the linebackers: 1. It’s a little odd to see an end-sized LB like LaDarius Owens listed on the weakside, but when you’ve got guys the size of Bates and Evans on the strongside, those distinctions maybe don’t mean exactly what we think they mean 2. yeah, I bet Ted Roof is glad to have a three-deep without any walk-ons, after last year’s second string featured two most of the year. — So much for the post-roster release contention that Onterio McCalebb hadn’t put on all that many pounds; he says he’s up to 180, nine pounds heavier than the roster weight and some 15 heavier than last year’s playing weight. He swears he’s even faster than before. Frankly, I’ll believe it–or even that he hasn’t lost any speed, much less added some–when I see it. But if we do see it, dude, this backfield is going to murder people. — Speaking of the roster, and weight, it was encouraging to hear Byron Isom say that Eric Mack could play even at 360 freaking pounds. If Mack really can play at that size, how much better will he be once he slims up a bit? Doesn’t change my opinion that Mack’s probably (though not definitely) still too big to move past Bart Eddins or John Sullen on the depth chart at guard this season, though. There’s something to watch for during fall camp. — Speaking of Sullen, Gribble reported he seemed to be working with the first team at right tackle. We’ve all assumed that spot was either Brandon Mosley’s or Roszell Gayden’s from the time they signed on. Maybe it’s a three-way battle now? — I think the biggest thing to take away from LaDarius Owens’, Trovon Reed’s, and Jeffrey Whitaker’s interviews with the media are that those are the three freshmen the coaches felt most comfortable sending out to meet with the media. We’ve heard that all three are intelligent players with a good chance to contribute early. (Reed particularly at this stage, given the rave reviews given him by Cam Newton and Demond Washington this week.) Based on Chizik and Co.’s decision to let them represent their incoming class at the first opportunity, I’d say we’ve heard correctly. — Still can’t help but contrast Ted Roof’s exuberance regarding Zac Etheridge with his relative curtness regarding Mike McNeil. — Think that’s about everything of significance from Day 1. Well, that and that Antoine Carter still has HOT BOY tattooed on his face. I was worried about him removing it over the summer; if we find out later it’s one of those Samson and his long hair type of deals, and now he can’t rush the passer any more, well, we wouldn’t have found out until it was too late, right? It can wait until after the season. And once more, apologies for the sparse content since oh, last Friday or so. Will do my best to make up for it over the next week. Jeffrey Whitaker is going to be interview “gold” for the next 4 years. Good to have you back Jerry. I’d skip thanking Woodbery. In fact, I’d just leave him off the list. i would like to hear something about Newton’s throws too. just to make me feel a little better. 1 for 8 in the spring game is all I got. Being an ex-journo myself, I’m lax to criticize any of those guys, all of whom work hard for relative peanuts and provide the information I’m not able to provide myself. But I will say that I always check Bitter first, and feel like he and Gribble are most likely to provide a nugget of information–like Sullen running with the first-teamers–that the only guys miss. While the other guys report what’s going on at practice, Woodbery focuses on facial tattoos and the 2004 mess. He hardly ever has a write-up on new recruits, but never misses negative Auburn stories (he’s usually the first one to post these). I don’t like smoke blown up my you know what 24/7 when it comes to Auburn, but always focusing on negative issues and wording things the way he does just doesn’t sit right with me. It’s obvious that I’m not the only one who feels this way. I think we can all agree that Bitter deserves to be first on the list. He goes above and beyond what is expected from a beat reporter. It comes as no surprise that he works for someone located outside of Alabama. I think Roof’s relatively ho-hum “Mike [McNiel] had a solid first day” falls into that category. As far as him being stoked about Etheridge’s return, I’m sure it has something to do with the nature of the injury from which he has fought back. It could have cost him the ability to walk. Alex, quite possibly. It certainly is easy to gush about Etheridge, no question there. But Roof seemed to take the same tack with McNeil in the spring as well. I’ll admit I could be reading too much into it, but Chizik and Thigpen have always seemed to be more upbeat about McNeil’s recovery and potential. We’ll see. I can finally breath. Real people doing real drills with real footballs. thanks for putting this together. Saves me about an hour a day bouncing around. Personal opinion on Woodberry – Make no mistake Alabama Football generates revenue. News on Alabama’s premier rival is part of the diet that feeds the beast. He writes with the Alabama Fan as his audience. From what I understand he graduated from UAT. The editor sends him down to Auburn to be the sheep in wolves clothing. I wonder if Auburn has a spy so to speak down in Ttown? They probably should. Nothing gets more clicks than someone writing something less than favorable about the Tide. Then again, who would volunteer for that suicide mission? And yes, he wrote for the Crimson and White. Fellas — I say give Evan a break. If anything, Evan does what a real reporter is supposed to do. He doesn’t have Auburn blinders on. I don’t want him to. I will say that it chaps me to read Alabama’s coverage in comparison. But rest assured: I don’t want Don Kausler’s and Genry Estes’ homer tones from Auburn beat writers. What I want is for some Evan Woodbery tone to bleed into T-town. That’s what real newspapering is. …..Gotta agree, Joe. Since Melick left the B’ham News for a BP PR gig, they’ve been spooning more Woodberry dreck at us subscribers here in the Tragic City. Boo. Charles Goldberg is sorely missed. There hasn’t been anything new on the Goldmine since July 20. TImes, they are a-changing. And not for the better, in the newspaper biz. Yes, Acid, they are. And it’s partly due to readers’ revealed preferences for sunshine and rainbows over messy truth. I’m guessing that Woodberry would be flattered that he’s not viewed by AU fans as a booster like some of the UA beat guys are. enough nice things about is not a criticism of someone’s reporting, but of his cheerleading. It’s our job to cheerlead, not the reporters’. Like I said, I don’t want smoke blown. I don’t want sunshine and rainbows. To that extent, I don’t want someone focusing on all of the negatives and negatively wording anything good. Both are just as bad IMO, and both show a complete lack of journalistic integrity. Beat writers are supposed to report the facts. There’s reporting, “The ball is red.” and there’s reporting, “The ball is the color of blood.” It’s all in the delivery, and you’d be a fool if you can’t see that his delivery is always the second of the two. Well Guys, I quit reading AL.com a couple of years ago and am better for it. Same thing as giving up Finescum radio. 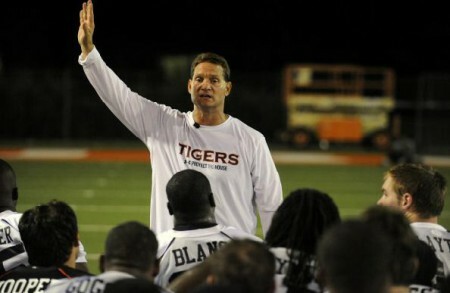 Joined Mark Murphy’s AUTigers.com and War Blog Eagle have not looked back. Best thing I’ve done in a long, long while. to mpg… I believe Cam was 3 for 8 in the spring game. Certainly not great, but it was pretty evident they weren’t gonna let him loose… most of those passes were on third down situations when the defense knew exactly what was coming. I’m sure he’ll be better. That is all. Continue with your day, citizen. Why the felt the need to move him and Woodbery off of the URLs they’d been building up for years, I have no clue at all. For the record, I don’t have a problem with Woodbery.